Making great port requires exceptional grapes and a deep knowledge of the production process. But most of all, it requires time, lots of time. Time for the nectars to lose the brashness of youth and mellow with age. That is why we cannot produce port wine by ourselves. We need our children and grandchildren to help. And if our great grandchildren can also lend a hand, even better. The British port-wine families guarantee their longevity by leaving the business to a single son or daughter and compensating their siblings with cash. In contrast, Portuguese families generally sell their estates to divide the proceeds among the heirs. There is why there are almost no major Portuguese port houses left. The one remarkable exception is Poças, a company that celebrated 100 years in August 2018. In 1918, Manoel Poças Júnior started buying brandy to supply port-wine producers. He was at times paid with barrels of port, so gradually he also became a port-wine merchant. In 1932, one of Manoel’s brandy clients paid a large debt with a wine estate called Quinta das Quartas. Manuel loved the estate which has granite tanks dating back to 1873. Every week, he made the arduous trip from Oporto to Quinta das Quartas to visit the vineyards. This passion is shared by his great granddaughter, Maria Manuela Maia, the viticulturist in charge of Quinta das Quartas and of the other two estates acquired by the family, Quinta de Santa Bárbara and Quinta de Vale de Cavalos. Even though today it is much easier to drive from Oporto to the Douro, Maria moved to the Douro valley to be closer to the vineyards. We met with Maria in Vila Nova de Gaia, at the cellars where barrels full of precious nectars produced by past generations are stored. She shared with us some superb ports: a Vintage from 1997, a Reserva from 2014, and a Vale dos Cavalos from 2015. Our tasting ended with fireworks provided by a remarkable 1967 Tawny, full of freshness and acidity. We filled our glasses with this liquid treasure and made two toasts: to Manoel Poças for the successes of the past and to Maria for the successes of the future. Click here for the Poças web site. To visit the Poças cellars email visitors@pocas.pt or call 223 203 257. This Summer we had the privilege of visiting one of these vineyards, the Quinta do Vallado, which dates back to 1716. We toured the cellars and tasted some of the quinta’s great table wines. At the end of our visit, we drank some wonderful old tawny port. With our glasses full of this golden nectar, we toasted the people of the Douro and their magnificent wines. Quinta do Vallado is located in Vilarinho dos Freires, Peso da Régua, tel. 254 323 147. Click here for their web site. People in the Douro valley say that babies and port wines are often born at night. Port producers let the grape juice ferment for about three days. They choose the perfect moment to add a neutral grape spirit (aguardente) that stops the fermentation before the yeast eats all the grape sugar. This moment often comes in the middle of the third night. Most of the Douro grapes are used to produce ruby ports. These inexpensive ports are first stored in cement or stainless steel vats to prevent oxidation and then bottled. The result is a wine that retains a dark ruby color and fresh fruit flavors. When the quality of the grapes is exceptional, port-wine producers declare a vintage year. These ports are stored in wood casks for one or two years and then bottled. With little exposure to air, the wine is dark red. Aging brings out complex flavors, such as notes of vanilla, chocolate, and blackberry. The best grapes are also used to produce tawnies. These ports are aged for many years in casks made of Portuguese chestnut and oak. This aging process creates complex flavors and gives the wine a silky mouthfeel. The small amount of air that circulates through the tiny pores of the wood oxidizes the wine slightly, changing its color from red to amber. It is wonderful to share a glass of ruby port with new friends. But there’s nothing like drinking old vintages and tawnies with old friends. Barca Velha is a mythical wine, the first Portuguese table wine to acquire an international reputation. Fernando Nicolau de Almeida, Casa Ferreirinha’s enologist, adapted the techniques used to produce vintage ports to make superlative table wine. 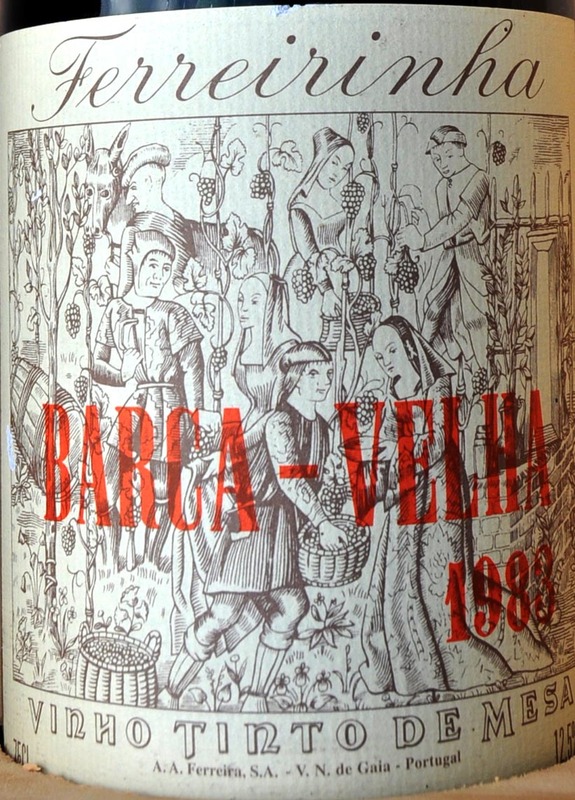 After years of experimentation, he produced the first Barca Velha in 1952 with grapes from a vineyard planted by Dona Antónia Ferreira. Since then, Barca Velha has been produced only 12 times, when the sun and the clouds joined forces to create exceptional grapes. How did Nicolau de Almeida decide whether a vintage merited the Barca Velha name? He relied on his wife. He took an unlabeled bottle home to share with her at dinner. If they finished the bottle by the end of the meal, the vintage was a Barca Velha.